This is a delicious and simple spin on traditional chicken cordon bleu. In just a few minutes, you have chicken ready to toss on the grill ... chicken so juicy and full of flavor that it will knock your flip flops off! 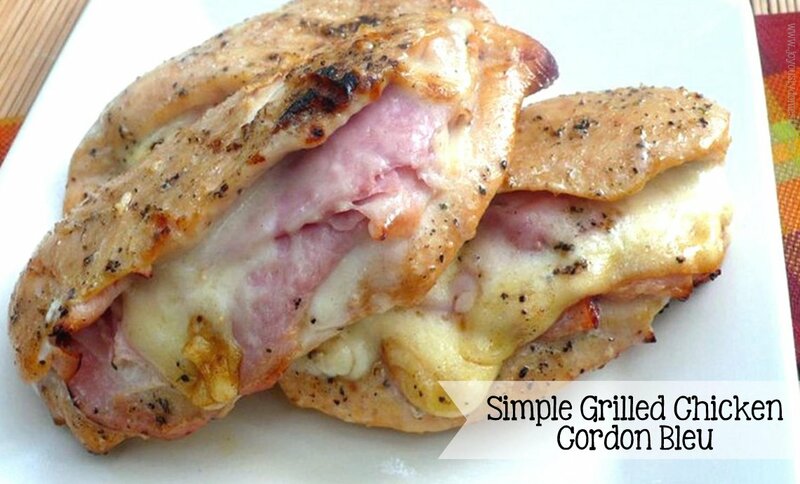 The ham does a wonderful job of keeping the chicken super tender and juicy while yielding some amazing flavor to typically bland chicken breasts. 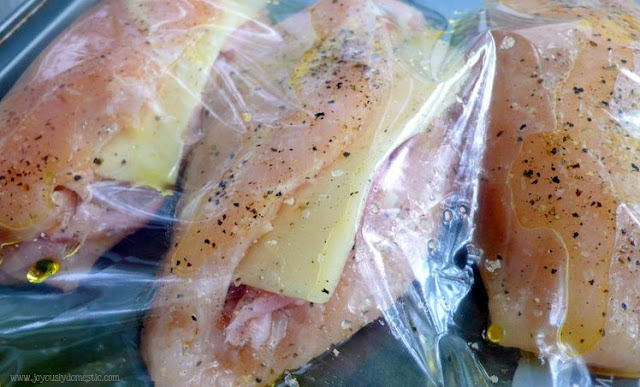 A beautiful thing about this, too, is that you can prep the chicken and have it ready in a zip-top bag. Just fire up the grill come dinnertime and cook these babies up in no time! Cut chicken breasts not quite all the way in half on an angle starting at the top of one side of the breast. Fold open. Lay down two slices of ham (folded up to fit). Top ham with two cheese halves - overlapping to fit. Close the chicken breast Continue with the remaining three breasts. Season both sides of each chicken breast with salt and pepper. Place the breasts in a large zip-top bag and drizzle in olive oil to well-coat all sides of the breasts. Allow to marinate in fridge for, at least, one hour. Place chicken cut-side up onto the grill. Close lid to grill or loosely cover indoor grill pan (if using) with foil. Allow to grill for 10 - 15 minutes on the first side. Carefully flip chicken over and allow to cook for about 5 more minutes or until chicken is cooked through. Cooking time will depend on the thickness of your chicken. Yum, I love cordon bleu! I used to make it for my husband and I all the time when we were first dating, I'm not sure why I stopped. Throwing this on the grill soon for sure! Such a simple way to make it on the grill, too! :) Hope you enjoy! Could I just do this in the oven? If so, what temp and how long? Did you try it in the oven yet?? If so did it work? Delicious! I made this last night for dinner and it was a hit. I used 1.5c of shredded swiss and .5c of shredded fiesta blend cheese. I ate leftovers for lunch today and look forward to eating the rest for lunch tomorrow. Could you do this on a George Foreman-type grill?